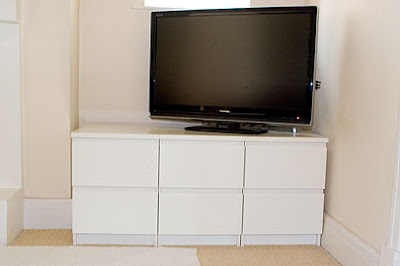 Our TV unit is actually made from three Ikea Malm bedside tables (nightstands). When we moved into this house it just happened to be what we already had, plus we had no money. 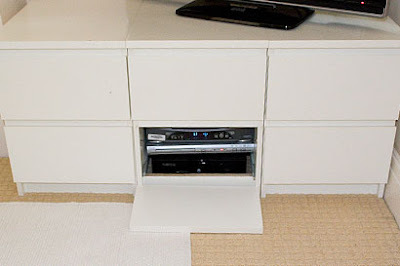 But it's really worked well as the drawers provide storage for videos, DVDs, remote controls, etc. It still needs something on the left for decoration, but let me distract you with our pretty new TV. 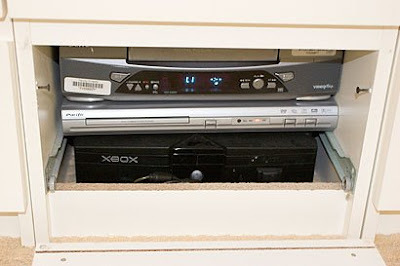 Okay, so where is the DVD player, video player and Xbox console? Inside the bottom drawer. 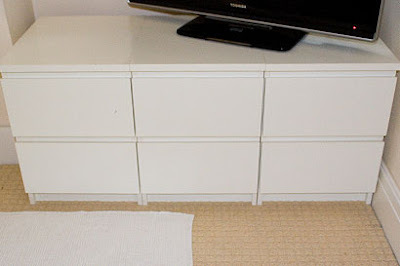 Well, actually inside the space where the drawer was - I've removed the drawer. The players are just stacked on the floor. See those two screws on the sides? 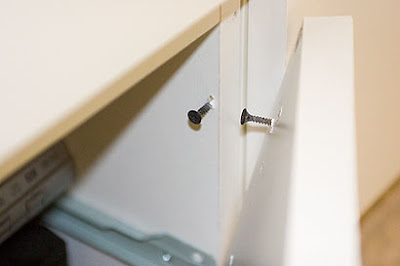 There are another two screws on the drawer front - they hook onto each other so that the drawer front can be put into place. This was Grant's idea after my hook system was destroyed by Noah within one day. Now you see it - open, for remote control reasons.